We provide hire of a great sounding, professional Pro Audio (PA) package with excellent environmental credentials. 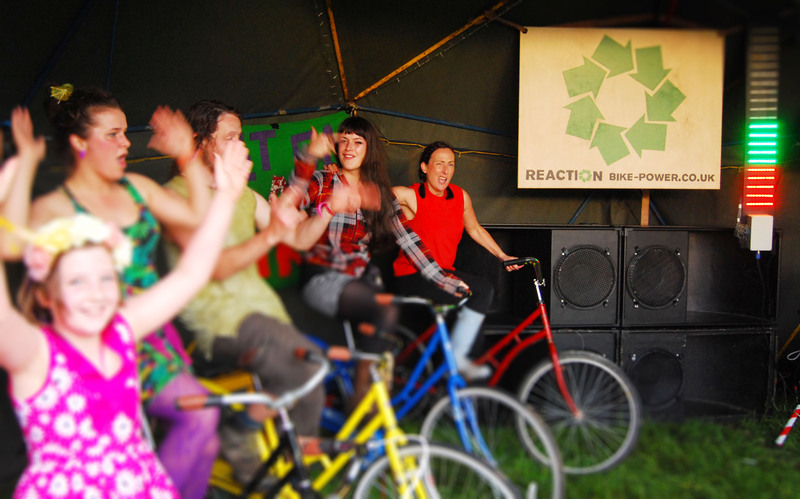 Pedal powered – using up to 10 bike generators. Volume can be as high as 116db SPL at 8meters, or 110db at 16meters from PA when required. The key is our use of extremely efficient PA speakers and amplifiers, combined with our high spec bike generators which have a special drive system. 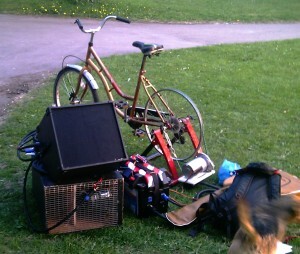 This means we can amplify music to really impressive levels with only a few people on the bikes. 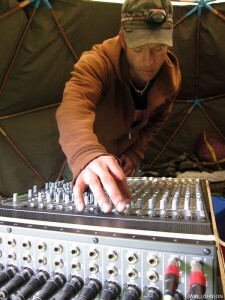 We also provide and power stage lights and mixing/engineering equipment so the whole event can remain totally off grid. 2000 people enjoying Hazel O’Conner’s performance on one of our pedal powered stages. Click on the image to see it big! Pedal powered Reggae Stage At Eden Festival. The idea is that people are always pedaling on the bikes and directly powering the music. The small (1Ah) Capacitor we use instead of a battery is only a buffer to smooth out the power levels. When you consider the alternatives mostly require at least 1 tonne of battery storage. 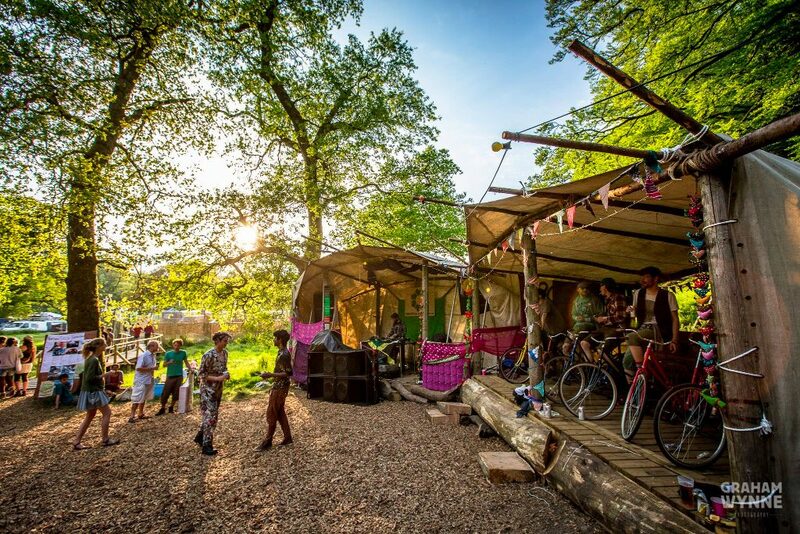 We offer a comparatively lightweight and easily transportable system which opens up a lot of opportunities for doing events in hard to reach areas and further reduces our environmental impact from travel. Our bike generators are open to the public to use. We have a special bright voltage meter which makes it clear to the audience how much power we have. We then slowly tweak the volume of the PA to balance the incoming power with the system’s power consumption. We need at least one person on the bikes at all times. When more people are pedaling the engineer can increase the volume. 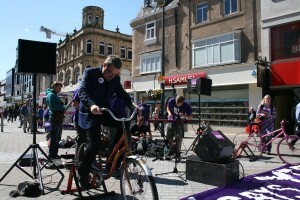 We have shown time and time again that pedal power works really well for events. Our system has worked for hundreds of bands of all genres and all of the promoters we have worked with have been very happy. Pedal power is great fun. It brings people together on the bikes, Brings the audience closer to the performers, Helps cold people warm up, Unhealthy people get fit, Shy people to meet people, and generally gets people involved. Kids absolutely love to pedal on the bikes! They really can’t get enough of it. Which parents love because it gives them a well deserved break too! 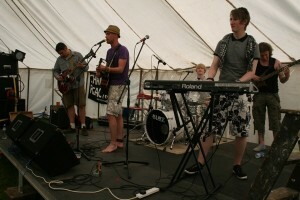 For smaller events we can offer a half sized PA with less bikes at incredibly low prices. 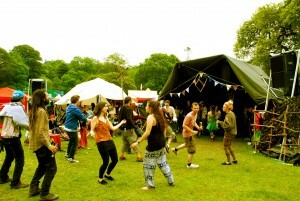 For Even smaller events where high fidelity sound is not required to the same extent. we can offer a mobile system suitable for public address or mp3player playback. This can be transported by bike trailer while playing (for as long as the battery lasts, which is normally 30-60mins) or setup with the bike used for generation to keep the sound going indefinitely!